Fall Water Care - you have to start preparing in advance! 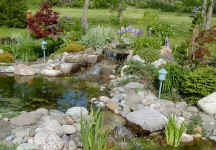 The water in the pond should be in as good a condition as possible to insure the survival of the fish during the winter! 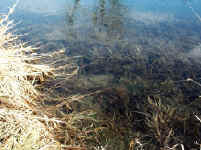 Remove as much organic waste from the bottom of the pond as possible using a net and/or vacuum. Check the pH and Nitrite levels. These are always very important, but even more so during the colder months when the health of the fish can deteriorate rapidly. Medicines do not work as well in colder water, so it is important to keep the fish at optimum health to prevent problems. Change 1/3 of the pond water if necessary. Add the appropriate amount of pond salt to aid slime coat regeneration of the fish and to help prevent parasites. Put a de-icer in the pond. These units will kick on when the water starts to freeze and let poisonous gases escape as well as oxygen enter. Cover the pond with a net to prevent leaves from being blown in and predators from reaching your fish now that the plants are dying down and they have less opportunity to hide. cover the pond with protective netting. In those areas where the pond water temperature will drop and stay below 48 - 50 degrees Fahrenheit, the pumps can be shut down in most cases about one week after all feeding of the fish ceases (an exception are crowded ponds, we will touch on that in another paragraph). The pumps should be removed from the pond and thoroughly cleaned. Oil filled pumps need to be stored in a bucket of pond or distilled water to prevent the seals and gaskets from drying out. Magnetic and epoxy sealed pumps can be stored dry. Filters should be thoroughly cleaned, inspected for damage (especially the UV light) and stored inside (basement or garage) to prevent freezing and cracking. The pump may need to continue to run in ponds with heavy fish populations (more than the generally recommended 1" of fish per 1 sq. foot of surface area), to provide adequate oxygen during the winter. In this case the pump should be placed on a plant shelf or on some bricks or rocks to bring it within a few inches of the water surface, to prevent constant circulation of the warmer water at the bottom of the pond where the fish will hibernate. Do keep the pump low enough to prevent freezing. To ensure survival of the fish during the winter in northern ponds, some minimum requirements must be met, now is the time to prepare. keep an open area if the pond starts icing over. This is a good time to thin out the fish population. 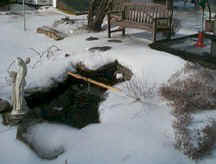 Ponds are low in oxygen during the winter if ice forms, and the problem is compounded if there are too many fish. It is important that the pond is deep enough so it does not freeze all the way to the bottom, so the fish have some area where they can survive. A place to hide from predators is required as plant cover is gone in winter months. Use sections of terra cotta pipe or flower pots turned on their side in the bottom of the pond to provide the needed cover. Run the Pond Pump Through the Winter? If the temperature of the pond for the most part stays cold enough for the fish to stay in hibernation AND the pond is not over-populated (1" of fish per 1 sq. ft. of surface area), then the pump can be disconnected. If the pond regularly warms enough (above 52 degrees Fahrenheit) that the fish have to be fed then the filter needs to run and consequently the pump is needed to power it. Caution: at these low temperatures fish should be fed easily digestible, specially formulated fall/winter food! water at the bottom of the pond where your fish are hibernating. If the pump is disconnected some provisions need to be made to allow carbon monoxide to escape from the water and oxygen to enter. The pond must not be allowed to freeze completely over for any length of time or fish death will occur! A floating de-icer is perfect for this job, since it kicks on when the pond starts freezing over and keeps a hole open at all times. A backyard pond becomes a natural, ecological environment which attracts creatures other than the fish we put in it. Birds, frogs, etc. need a place to winter. Don't forget to hang some bird feeders, make a few small rock piles and put some evergreen branches in protected places for these creatures to hide. Just because we do not always see them does not mean they are not there. 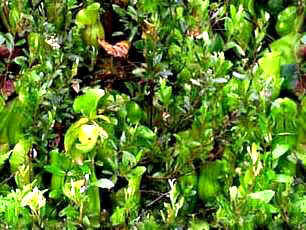 Prune hardy hardy perennials and move deep enough to protect the crowns from freezing. Move tropical aquatic plants into the house. Remember that the digestive system of the fish slows down as the water cools. Switch to an easily Digestible diet and reduce feeding. Examine fish for parasites and disease. Stop feeding when the water cools below 50 degrees. as possible using a net/and or vacuum. Check pH and nitrite levels. Put a floating de-icer in the pond to insure adequate oxygen/carbon monoxide exchange during freezing weather. Cover the pond with a net to prevent leaves from contaminating the water when they decompose.